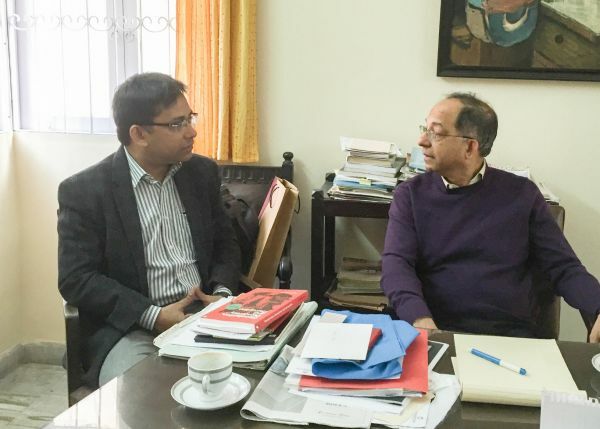 Parikshit Ghosh (Associate Professor of Economics, Delhi School of Economics) speaks with Kaushik Basu (Chief Economist and Senior Vice President, World Bank and former Chief Economic Adviser, Government of India) on issues ranging from the change in World Bank’s mission and its engagement with the world, rising inequality in the developed world, managing the negative side effects of growth, to the role of behavioural economics and paternalism in development, and the exclusionary nature of the ongoing digital revolution. This interview is part of I4I Conversations series by Ideas for India. Parikshit Ghosh (PG): When the World Bank was founded, it was out of a sense of international economic cooperation and perhaps there was a feeling that the development of poor countries coincided with the interest of richer countries. But of late, there has been a lot of heartburn about things like outsourcing, immigration, and equity issues surrounding climate change talks. Do you see a rift developing between the North and South? And if that is so, what does it imply for the World Bank’s mission and how does the Bank plan to handle it? Kaushik Basu (KB): I don’t see a new rift developing between industrialised countries and emerging economies. There have always been some lines of tension between the two, which shift occasionally from one area to another. We are today much more sensitive to the climate consequences of what we do and therefore some of the tension is around climate change issues. Historically, tensions have developed over World Trade Organization (WTO) negotiations or when the International Labour Organization (ILO) tried to bring in core labour standards common to the world. I myself had written how one labour standard for the world means very little. If you set this at a level reasonable for developing economies, it would be meaningless for high-income countries; and if you set it at a level where it has some bite for high-income countries, it would destroy the labour market in most developing countries. What is interesting is that the World Bank’s engagement with the world has undergone a change compared with the time of its founding just after World War II. And in recent times the arrival of the new banks - Asian Infrastructure Investment Bank (AIIB), Brazil Russia India China and South Africa (BRICS) Bank or the New Development Bank – is causing some shift in the nature of the World Bank’s mission. PG: How exactly is the Bank’s mission changing? KB: One very interesting change is a return to reconstruction work. This was the World Bank’s original mission after the devastation of World War II, though ending poverty became the goal subsequently and still is. What has happened over the last few years is that once again there is talk of reconstruction type work because of the major political disruptions. Some countries in South Asia and the Middle East, which are not really as poor as the sub-Saharan African countries, are reeling under a refugee problem that is a bit like the aftermath of a major war. One piece of data which is striking is that the average refugee in the world now remains a refugee for 17 years. That immediately changes your nature of engagement with these people. It is not just about providing them food and letting them survive from one day to another. They need education, they need health, and they need jobs - so that they are not damaged human beings after 17 years. There has been another broad change in the World Bank’s engagement with the world after I joined the Bank and was asked to help set up a few mission goals. In addition to fighting absolute poverty, we decided to add another goal, which we call promoting shared prosperity. Basically, it is attending to inequality, by focusing on the growth rate of the bottom 40% vis-à-vis the rest. The World Bank is very comfortable with this now, but when I started this discussion at the end of 2012, there was a lot of resistance, with some arguing that this entailed being nosy about rich countries as well. Scandinavian and Nordic countries were happy but there were others who were not so happy. We did not have the data capacity and had to get Organisation for Economic Cooperation and Development (OECD) to help us. As an international organisation, focusing on inequality was very new. PG: There is a dramatic increase in inequality in the developed world; we are back to the pre-Depression era. This is getting a lot of publicity and people are invoking various factors including trade, technology, globalisation, rightward shift of politics and so on. If you were to put your finger on the most important cause, what would be your diagnosis? KB: Technology - and two particular kinds of technological change. One is just technological innovation whereby you can do with less labour. Number two, is technology which links labour in different parts of the world. I called this labour-linking technology. This, it turns out, is good for those poor countries which are well enough organised to take advantage of these new opportunities. If you look at the last 30 years, the wage bill in rich countries is becoming a smaller share of the gross domestic product (GDP) at a rate that is quite remarkable. You cannot continue at this rate without groups of workers being decimated. Robot sales last year were a record number, and then there is outsourcing of work. You cannot grudge the outsourcing. These are even poorer people who have the skill, who earlier needed an immigration visa, and now don’t. They can sit where they are and begin to link up with the world. But all this is holding back the incomes of the poorer people of the rich countries and pushing up the incomes of more skilled people in the poorer countries. Many other things are happening, but I think this is playing a major role in driving up inequality. People are also earning a larger and larger share of their income from bits and pieces of paper they own - a patent that you have, a share that you hold. I think all this is feeding into increasing inequality. To me, this is no individual’s fault, but it will be our fault if we do not respond to this global trend. There is a need for very major rethinking of the sources of income for people: you may want to have some equity or share in stocks being distributed to workers. Make a thought experiment: if someone discovers a robotic machine that can create other robotic machines, then one person will have the right to virtually everything being produced in the world. Should we really risk getting into a predicament like that? PG: One aspect of inequality is inclusive growth — how to make growth accessible to the bottom 40% or 20%. But it seems, in India, there are some negative side effects of growth. Examples include the land acquisition problem or air pollution - which is now becoming a political issue. The Left is often critical of the development model that institutions like the World Bank or IMF have been pursuing. How do we manage growth without these negative side effects? KB: I think the nature of growth has to change. If we continue in the same way, we are going down a path which is not good for all of us. But you cannot hold back developing countries, which are still abysmally poor. What we need is to think of growth differently. We typically think of growth as more of everything. But growth can involve breakthroughs in medical research. Instead of eating more food and building fancier houses, if we can make dramatic improvements in our health, the value of that can be huge. This will be growth which is not damaging to the environment but leads to better lives. There too you can get some new challenges. If you get a medical breakthrough, which is so expensive that only a thousand people can get it, it will increase inequality. The basic point is if we are to survive climate change and other challenges, you do not want to slow down growth but change the nature of what it is that we are consuming and what constitutes a better life. PG: The latest World Development Report puts a lot of emphasis on behavioural biases. In the 50s, the main bottleneck for development was thought to be resources and investment, and the Bank’s role as a funding agency was cut out. Then came the idea that institutional and market failures are very important. Now you are emphasising these behavioural biases. Maybe people do not have the right goals and values; maybe some moral suasion has to take place. What is the Bank’s role here? How can it help? KB: This, I feel rather good about. This is the first World Development Report that was commissioned under my charge and I chose this topic, and we decided to call it ‘Mind, society and behaviour’. Introducing this topic was again marking a bit of a shift in the World Bank’s engagement. Fortunately we had very good people there like Karla Hoff and Varun Gauri, who have done interesting work in this area. This is an extremely important topic and I had written about it earlier from a theoretical perspective. Some standard axioms of economics are satisfied by rats, but rats do not trade and exchange because they do not have some common underlying values and customs that are needed. In economics we never write them down because we take them for granted. For example, a common language or a modicum of trust is essential for a society to function. There are a number of exchanges and trades we do without bringing in the cops, without signing of contract, just because we trust one another. In societies where you don’t have that you cannot perform these functions. The World Development Report tries to bring these into the mainstream of development. When the private sector tries to sell a product, it is not just about making the product as nice and cheap as possible. Where it is placed in the shop window, next to what product with what price tag - those things play on human psychology. The private sector uses this knowledge of the human mind set all the time, but the development sector seldom used it. And that was my aim with this World Development Report. Our latest World Development Report called Digital Dividends, which we launched in January, is also one I am very proud of. Its main premise is that while the internet, mobile phones and other digital technologies are spreading rapidly throughout the developing world, the anticipated digital dividends of higher growth, more jobs, and better public services have fallen short of expectations; and nearly half the world’s adult population remains excluded from the ever-expanding digital economy. The digital revolution is transforming the world, aiding information flows, and facilitating the rise of developing nations. This is wonderful news and we must embrace this revolution with open arms. But while these achievements are to be celebrated, this is also occasion to be mindful that we do not create a new underclass. With over 15% of the world’s population unable to read and write, the spread of digital technologies alone is unlikely to spell the end of the global knowledge divide. PG: For the World Bank, providing funds is straightforward. But now you are talking of something which will require more intrusive, maybe more paternalistic intervention. Isn’t that a political minefield? KB: Indeed, one criticism that we got in the beginning was that you are taking World Bank into paternalism. But for me, as soon as I know that through one particular action of mine, I will make you choose ‘a’, and by not taking that action you will choose ‘b’, I cannot escape paternalism anymore, because I know that if I do nothing I am prompting you to choose ‘b’. I feel that given the amount of knowledge that we have today of human psychology, paternalism is inescapable. It is best to confront it and do it as morally correctly as possible. There are two different kinds of paternalism. One is where I insist that, like it or not, you have to fasten your seat belt. There are cases in life where we do that. But there are other forms of paternalism, where we place something in front you, present it in a certain way; for example, when I am trying to persuade you to take your medicine regularly. That is another kind of paternalism where you have the freedom to reject, but I am using my knowledge of how you think. PG: I recently read your new proof of the Pythagoras theorem. So after dabbling in the messy real world, was that a bit of a welcome diversion?! KB: It was sheer pleasure working on this. Arunava Sen got me interested in this. It is from him that I learnt that the 20th President of United States, James Garfield, had developed his own proof of this ancient theorem. Geometry has been a pet subject of mine. As it happens, this is the only subject that my father taught me. Quite remarkably, he did this when he was Speaker of the West Bengal Assembly. Clearly he also relished the subject. After Arunava told me, I read up Garfield’s proof, which was published in a New England journal. Then I began playing around, looking for yet another way of proving the theorem; and to my delight I found this proof via a property of isosceles triangles. This is of course nothing but recreational maths - an intelligent school kid could do it, but for me it was fun. And I feel vindicated having spent time on this, since the paper is now coming out in American Mathematical Association’s College Mathematics Journal. Now I have to tell you - I have another project. About 50-60 years before Pythagoras, there was Thales of Miletus, who proved a theorem about triangles and circles. Over weekends, I have been dabbling in Thales’ work, so maybe I will be able to go a bit further back into history than Pythagoras! Choosing digital dividends as title for WDR is an appropriate choice by WB.While KB has rightly pointed out that 15% population lack reading skill but what he failed to point out that in multi lingual world it is very important that things are in native languages.Consider India, India is such a diverse country with hundreds if not thousand languages but most of the content is in English language and if we provide them digital connection then also they won't be ale to use it effectively. So, we should strive to provide content in the local language.And Thanks for the interview,it is always informative to read KB.